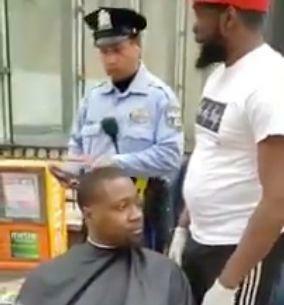 <p class="canvas-atom canvas-text Mb(1.0em) Mb(0)–sm Mt(0.8em)–sm" type="text" content="A Philadelphia barber who has been providing free&nbsp;haircuts&nbsp;for the&nbsp;homeless&nbsp;in his community since 2017 was almost shut down by a local&nbsp;police&nbsp;officer on Wednesday in an encounter that was caught on camera.” data-reactid=”22″>A Philadelphia barber who has been providing free haircuts for the homeless in his community since 2017 was almost shut down by a local police officer on Wednesday in an encounter that was caught on camera. <p class="canvas-atom canvas-text Mb(1.0em) Mb(0)–sm Mt(0.8em)–sm" type="text" content="Brennon Jones, who goes by B Jawuan Jones, has received&nbsp;viral&nbsp;fame and praise multiple times since he began his initiative called “Haircut4Homeless” a few years ago. But a recent incident involving Jones has gone viral on Twitter for a different reason as users claim that an officer tried to “criminalize” the man’s good deeds.” data-reactid=”24″>Brennon Jones, who goes by B Jawuan Jones, has received viral fame and praise multiple times since he began his initiative called “Haircut4Homeless” a few years ago. But a recent incident involving Jones has gone viral on Twitter for a different reason as users claim that an officer tried to “criminalize” the man’s good deeds. <p class="canvas-atom canvas-text Mb(1.0em) Mb(0)–sm Mt(0.8em)–sm" type="text" content="In a&nbsp;video&nbsp;posted to Twitter by activist user StanceGrounded, Jones is seen being approached by a police officer as he’s giving a haircut. Jones tells Yahoo Lifestyle that it was his first encounter with the police — and a confusing one at that.” data-reactid=”27″>In a video posted to Twitter by activist user StanceGrounded, Jones is seen being approached by a police officer as he’s giving a haircut. Jones tells Yahoo Lifestyle that it was his first encounter with the police — and a confusing one at that. Thank God for video cameras! No one would believe what’s happening here was real if s/he didn’t see it. Now trying to help someone down on his lack is a crime? We should applaud men like this barber! God bless him… & the homeless people to whom he’s showing compassion. <p class="canvas-atom canvas-text Mb(1.0em) Mb(0)–sm Mt(0.8em)–sm" type="text" content="Follow us on Instagram, Facebook, and Twitter for nonstop inspiration delivered fresh to your feed, every day.” data-reactid=”48″>Follow us on Instagram, Facebook, and Twitter for nonstop inspiration delivered fresh to your feed, every day.